Posted on Tue, Feb 14, 2012 : 1:04 p.m. Rendering of the planned Dexter Wellness Center. The Dexter Wellness Center, planned by BST Investment, for 2810 Baker Road, got unanimous final site plan approval from the Dexter Village Council Monday night. Two weeks ago, the project gained preliminary site plan approval by the Village Council and final site plan approval was granted by the village’s Planning Commission last Monday. The project previously received a $230,000 brownfield redevelopment financing package from the Michigan Economic Development Corp’s Michigan Econononic Growth Authority. The developer also asked for a three-year payment plan for the tap fees for the project that total $144,942. The yearly payments will be about $48,314. 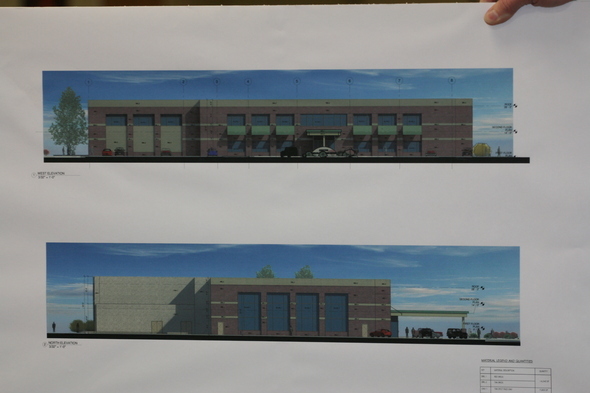 BST Investments plans to spend about $9 million to develop 88,000 square feet of commercial space. This portion of the project, on 7.4 acres, includes the demolition of a 83,345-square-foot light industrial building and the construction of a new about 48,000-square-foot building . The new facility is expected to create 50 to 60 new full-time jobs at an average hourly wage of $18, according to documents the developers filed as part of the brownfield redevelopment application. BST Investments previously redeveloped the northwestern corner of the property, demolishing two buildings and constructed a new building occupied by Dexter Pharmacy. The Wellness Center is the second phase of a three-phase redevelopment of the former Colorbok space. In addition, apart from this project, the construction of a third, multi-story, brick commercial building is planned, according to the project description submitted to the state. The project was first approved in 2007, but was not constructed and the Village Council approved a new site plan that included minor changes to the floor plan, elevation and parking lot layout according to information supplied to the council from Allison Bishop, community development manager. Council Member Ray Tell was absent from the meeting. Wed, Feb 15, 2012 : 4:08 p.m.
whos the architect of record? Tue, Feb 14, 2012 : 9:03 p.m.
Do you know when it might be completed? This is a great addition to Dexter. I'm very excited for it.